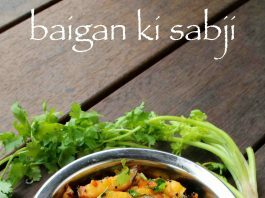 baigan ki sabji | baingan ki sabzi recipe | baigan ki recipe with detailed photo and video recipe. 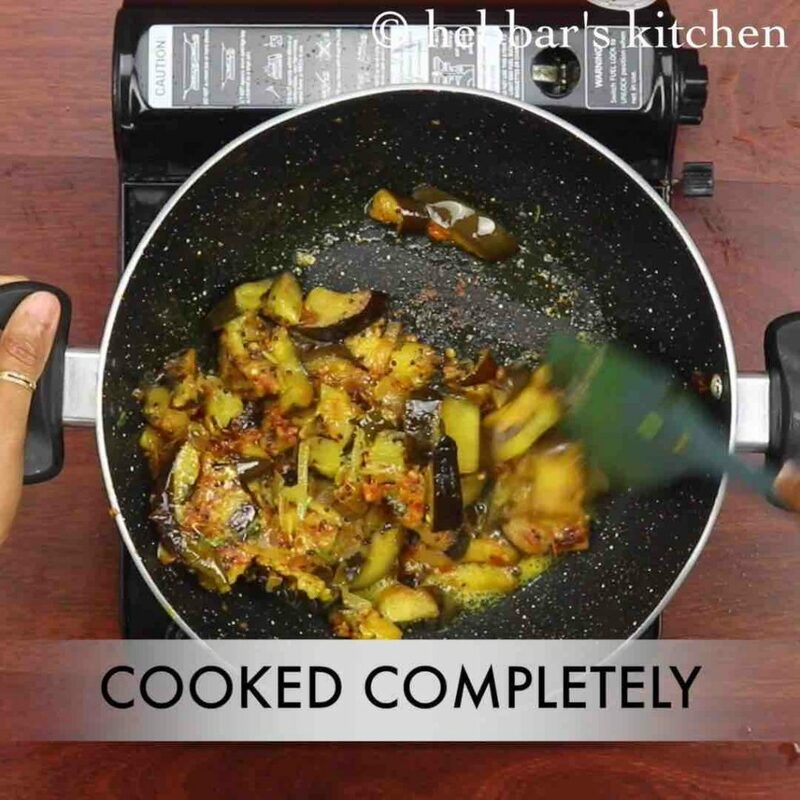 a simple and healthy dry curry or sabzi recipe prepared mainly with purple brinjal and spiced with sambar or rasam powder. it is an ideal side dish or sabzi to your daily dinner or lunch and can be relished with chapathi or dal rice / rasam rice combination. 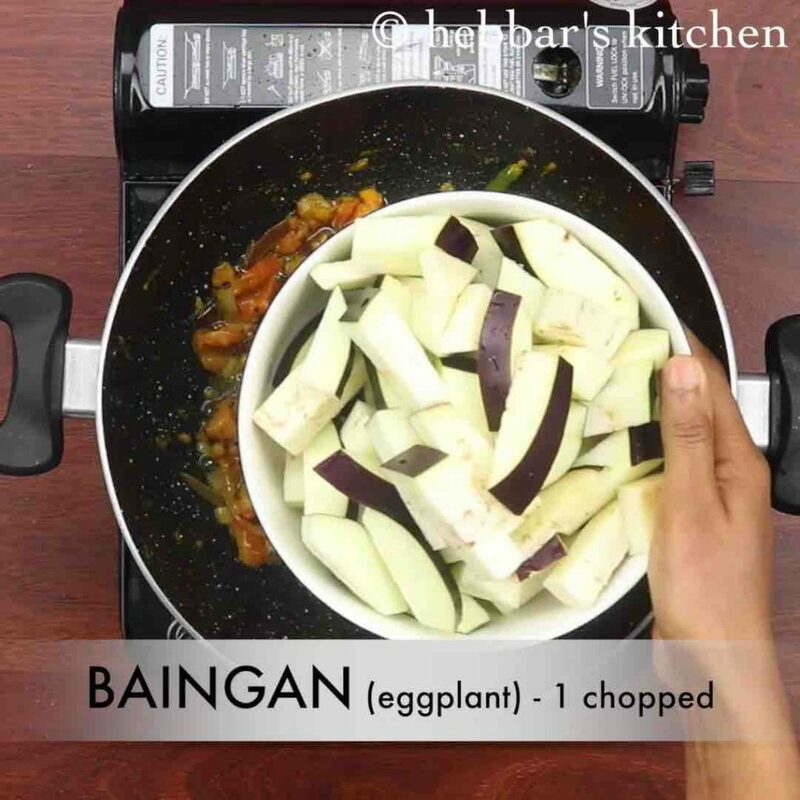 baigan ki sabji | baingan ki sabzi recipe | baigan ki recipe with step by step photo and video recipe. 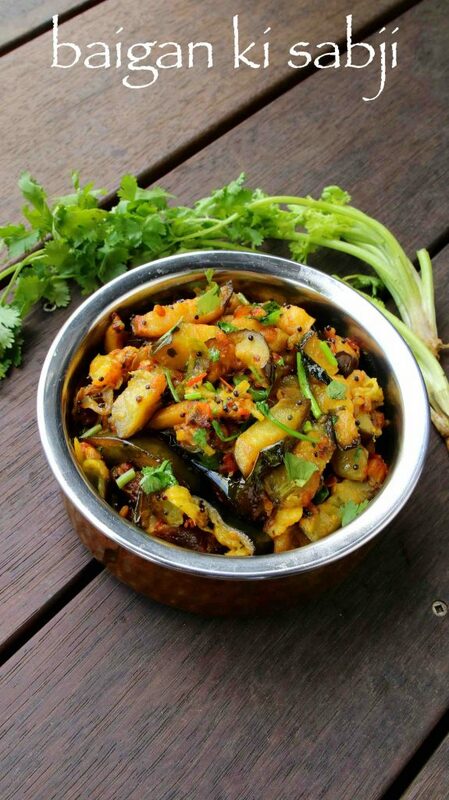 the recipe for dry brinjal curry can vary with region to region and place to place. this recipe of dry brinjal curry or vangi curry is a south indian version and prepared with either sambar or rasam powder. it is prepared instantly for either dinner or lunch and tastes good as side dish to chapathi or roti. 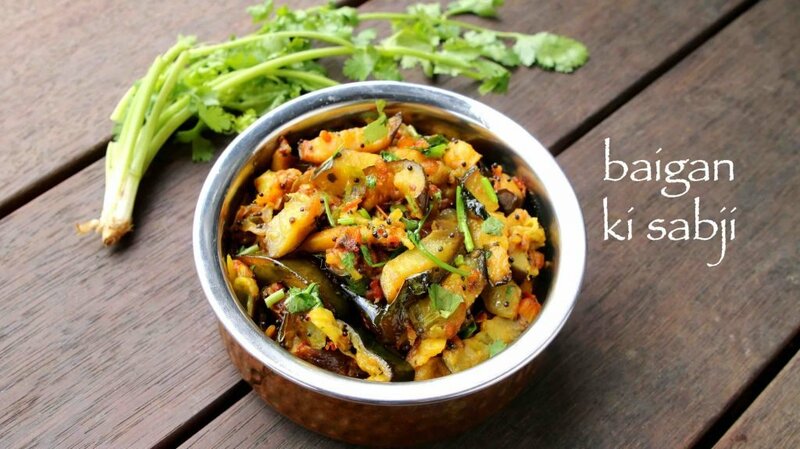 i have shared a several version of brinjal curries till now but this is my personal favourite and i prepare it very frequently. the main reason i like it is because of the ease of the recipe and can be prepared within minutes. i prepare baigan ki sabji whenever i run out of option and i am in no mood for some fancy curries. 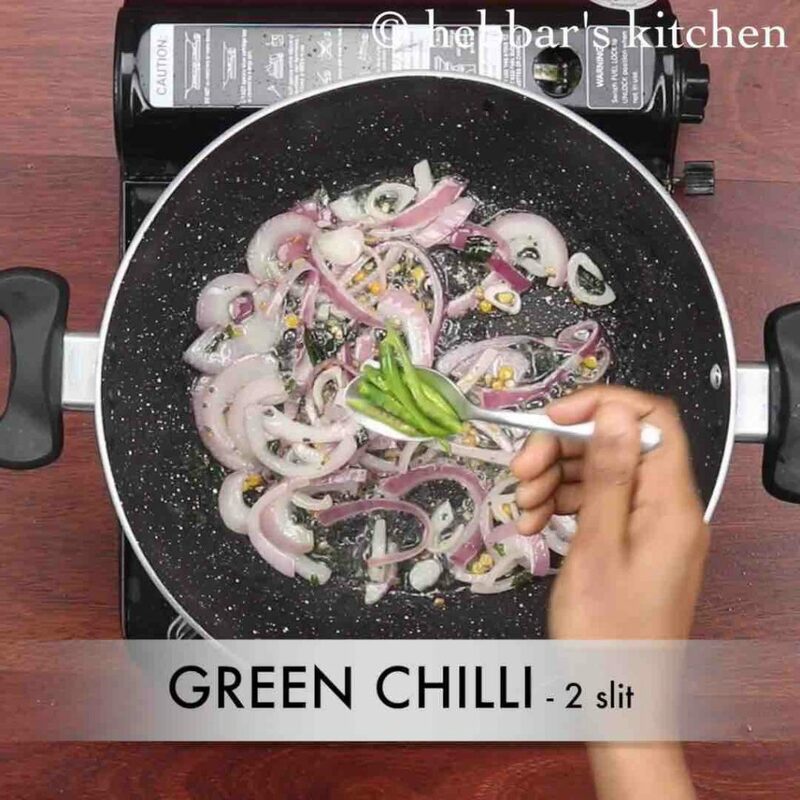 as i mentioned earlier there are several ways baigan ki sabji recipe can be prepared and even i prepare it in several ways. in this i have followed south indian style to prepare it but i can also be prepared north indian and also western indian style too. in north india it is prepared similarly but curry powder or kitchen king masala is added. peanut powder too can be added as prepared in western india by adding some crushed peanut powder. 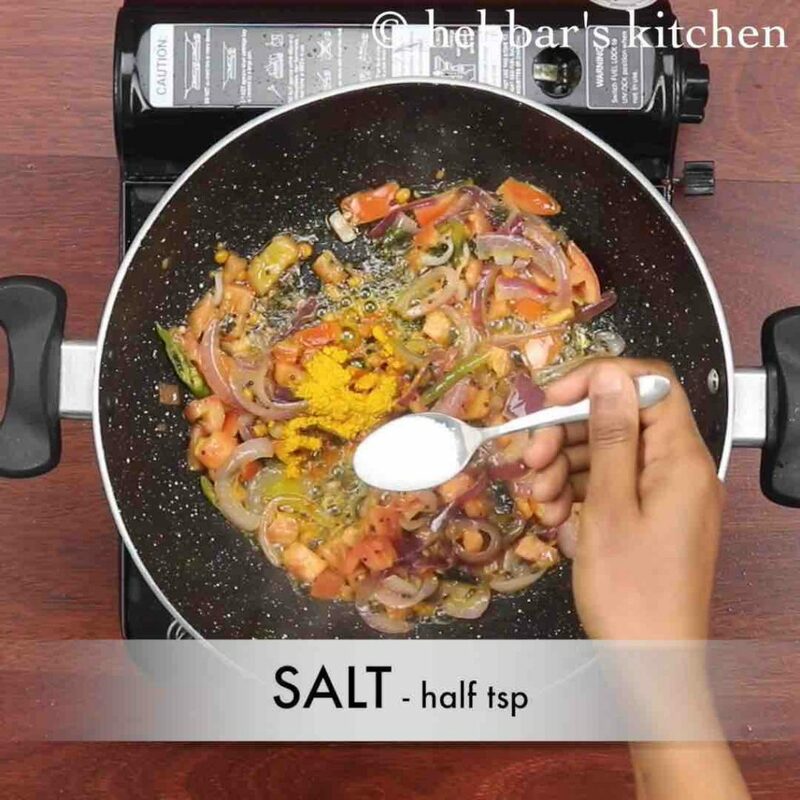 the recipe is extremely simple yet some tips, recommendations and serving suggestions for baigan ki sabji. firstly, in this recipe i have used only slices of bringal or eggplant to prepare the dry curry. 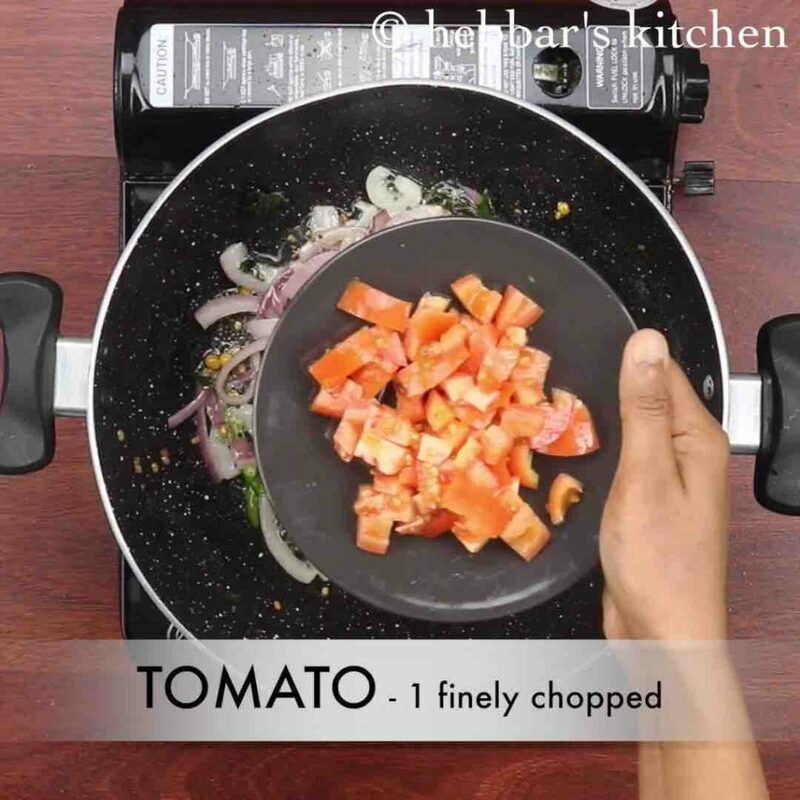 alternatively, you can add potato for aloo baingan, tomatoes for baingan tamatar recipe. in addition you can also add grounded cashew paste with sautéed onion, tomato paste to prepare aloo baingan masala recipe. it makes a ideal match to roti/chapathi and also to steamed rice. 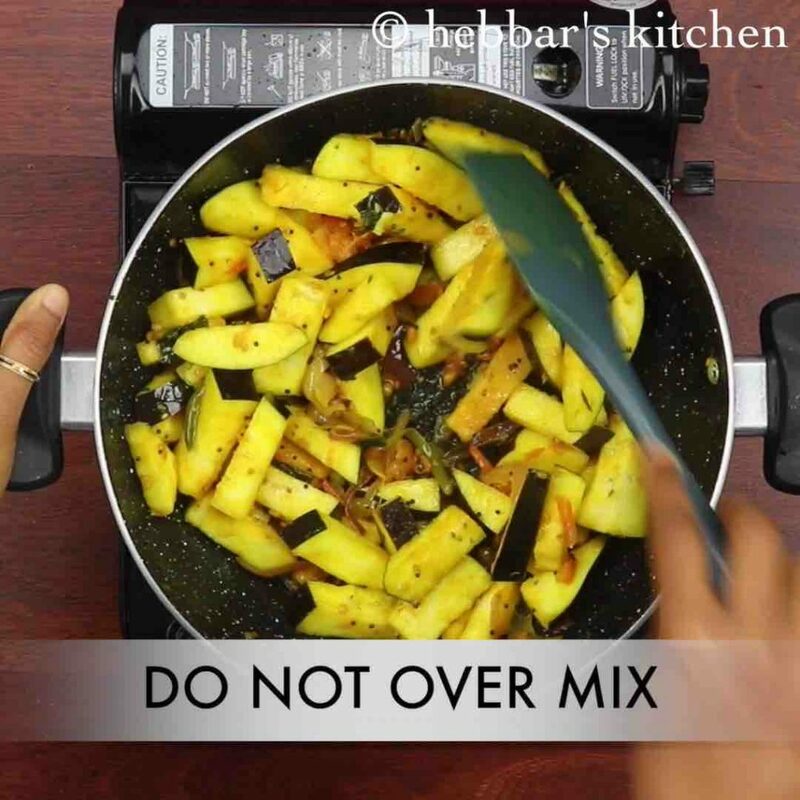 lastly, do not compromise with the oil, or otherwise brinjal may stick to bottom and perhaps even burn. 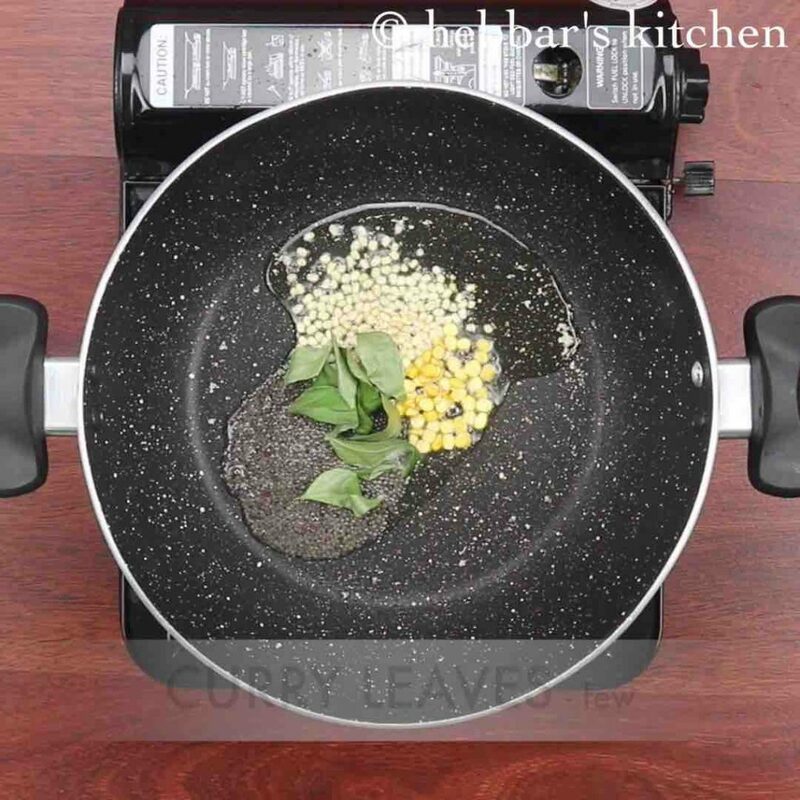 firstly, in a large kadai heat 3 tbsp oil and splutter 1 tsp mustard, 1 tsp urad dal, ½ tsp chana dal and few curry leaves. add in 1 sliced onion and saute. also add 2 green chilli and saute well. additionally, add in 1 tomato and saute till tomatoes turn soft and mushy. furthermore add ¼ tsp turmeric and ½ tsp salt. saute well. now add in 1 chopped baingan and mix gently. do not over mix, as baigan turns mushy. 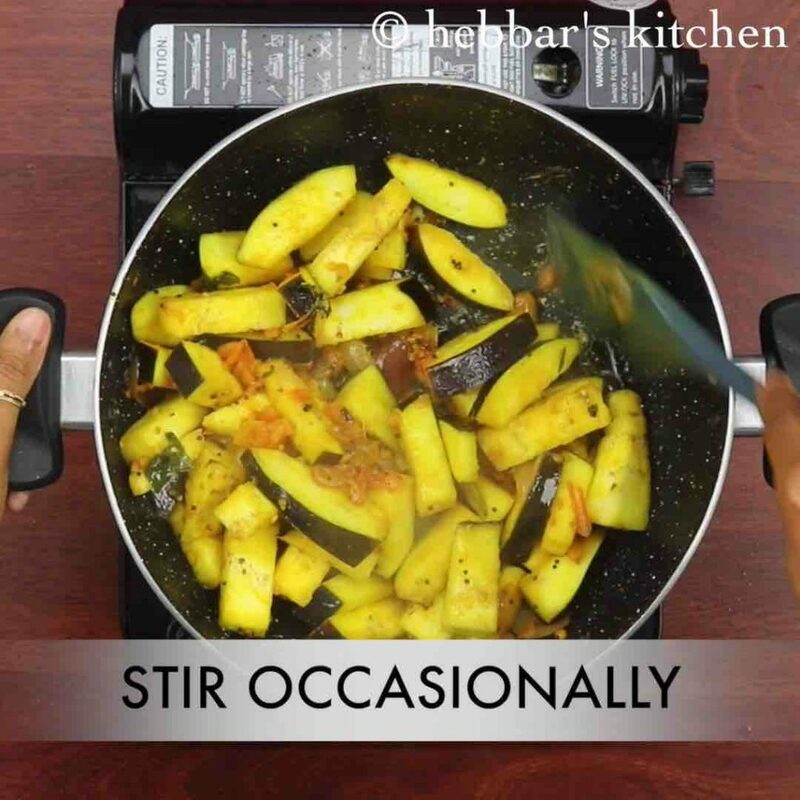 cover and simmer for 10 minutes or till baingan turns soft. stir occasionally, making sure the baingan doesn't burn. 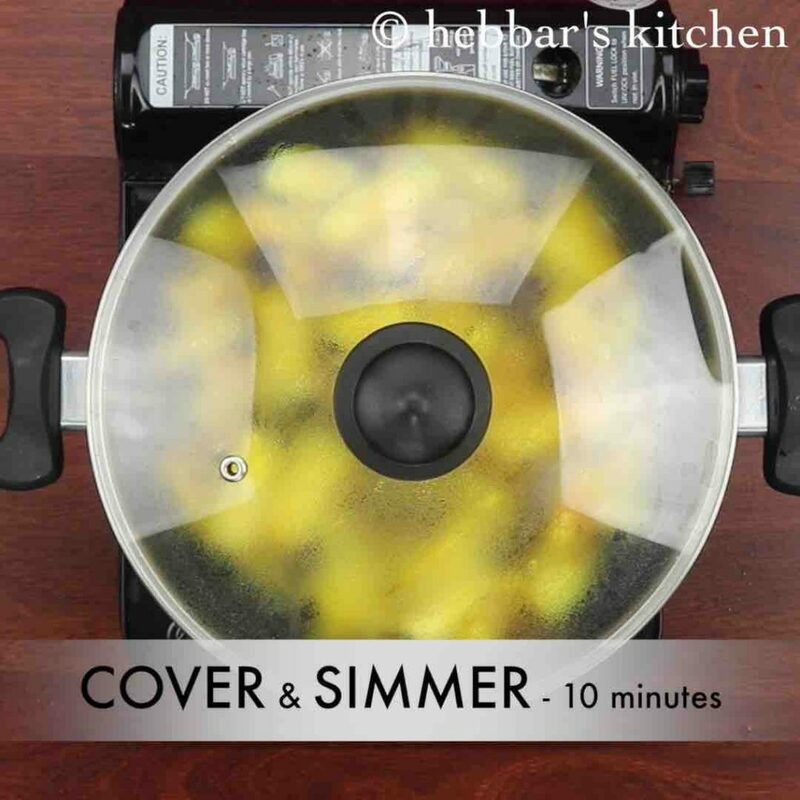 cover and cook till the baigan cooks well and releases oil. add in 2 tbsp coriander and mix well. 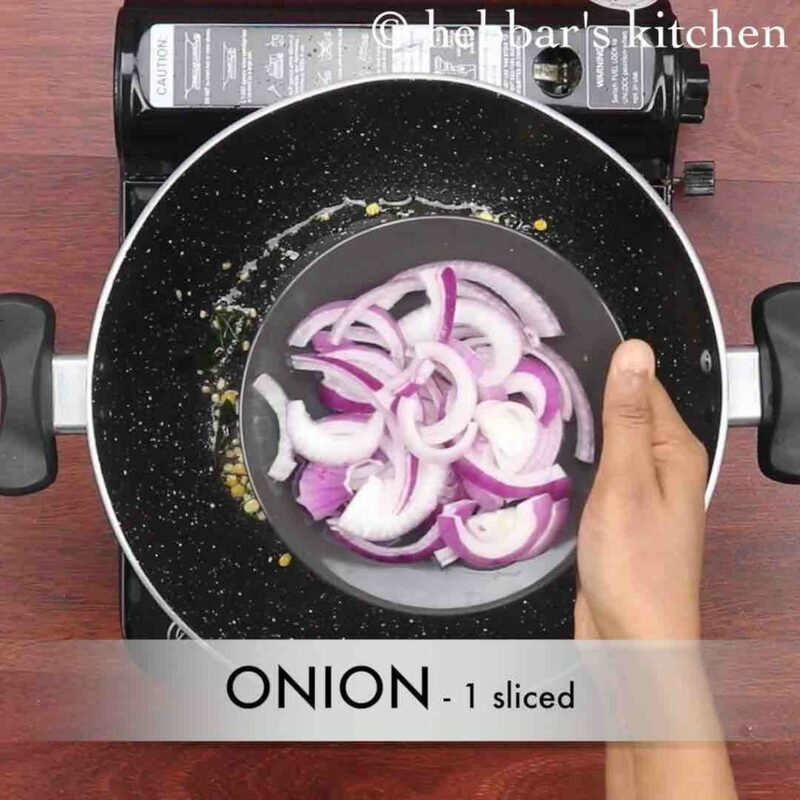 finally, serve baigan ki sabji recipe with rice or roti. stir occasionally, making sure the baingan doesn’t burn. 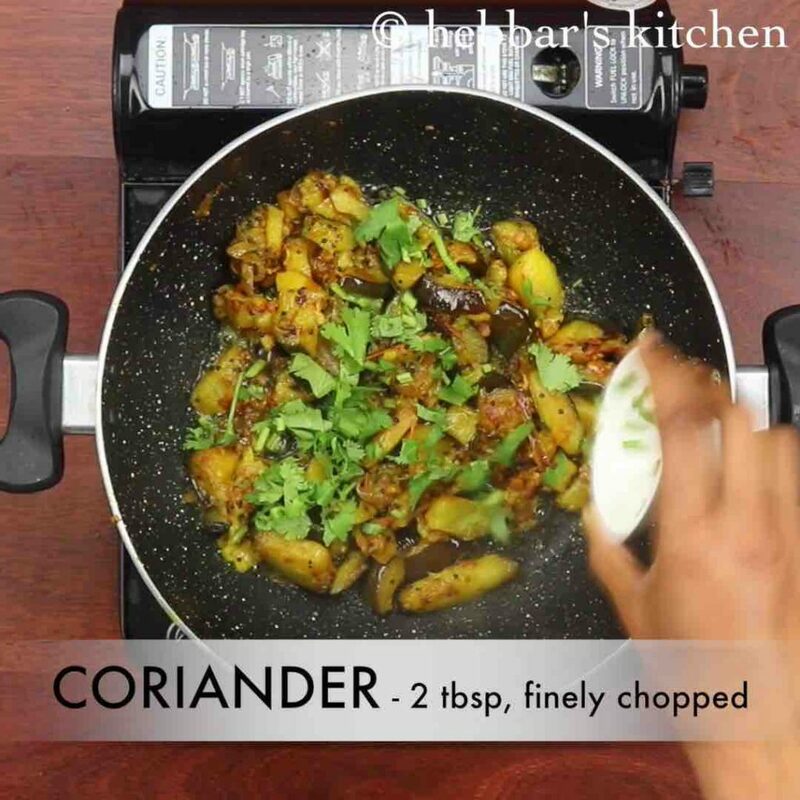 firstly, make sure to use fresh baigan else the sabji turns out dry. also do not compromise with oil, as baigan cooks with oil itself. additionally, use tamarind extract if you do not want to use tomatoes. finally, baigan ki sabji recipe taste great when served hot and spicy. you have very nice videos. Which software you guys use to make videos.